When I first got the brush out of the box, I was impressed by the weight of the product. It's obviously much heavier than a normal hairbrush, but isn't too weighty to the extent that it's impractical. I can comfortably use this device without getting achey arms. The design is very sleek. The body of the brush has a matte, black finish which contrasts beautifully with two lines of pink at the edges. This pink matches the ceramic plate surrounding the bristles. As you can see from the photo above, the bristles are definitely not 'conventional bristles'. They're considerably chunkier - particularly in the centre of the brush pad. At the edges the size reduces somewhat and you're then left with some finer black bristles right on the outside. The black parts of the bristles are made of rubber, whereas the pink surfaces are the ceramic plate which will increase in temperature. 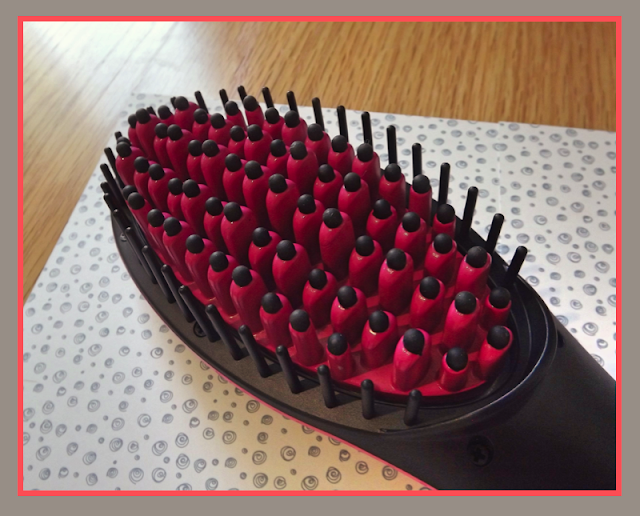 As the plate surrounds each of the black bristles, you can expect all of your hair strands to be exposed to the heat. This will give a more even straightening effect than you might get with hair irons. 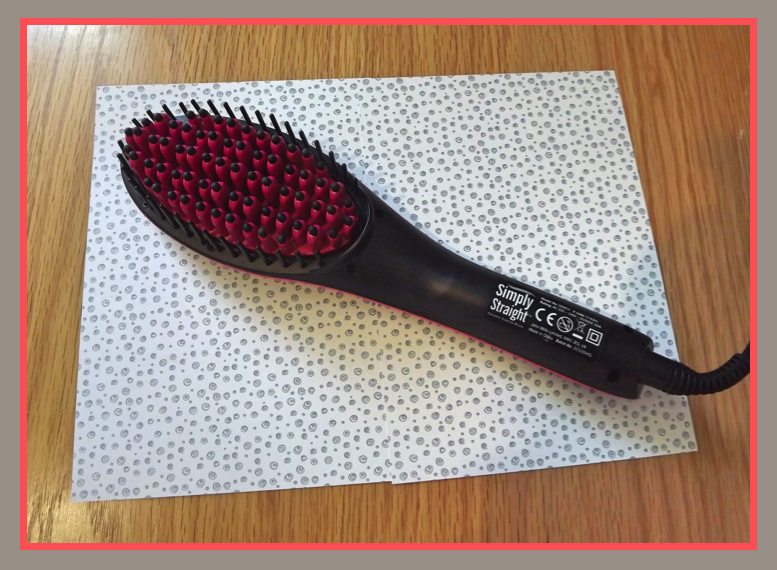 The maximum temperature of the hairbrush is 230 degrees and, I have to say, I was massively impressed by how quickly the device reaches temperature. It's a lot faster than my straightening tongs. On the back of the brush you'll find an LED display screen which tells you the current temperature. This means you can watch the temperature rapidly rising and see exactly when it's ready to use. I've found this screen a lot more useful than the 'green light' method that other electricals tend to use. I think it's because I have a good idea of when exactly the brush will be ready from the rate the temperature is increasing. Below the screen you'll find the power switch, as well as a '+' and '-' button. These handy buttons allow you to modify the temperature according to what finish you'd like. For example, if you want impressively straight hair, you'd whack the temperature right up. If you just wanted to soften some curls, perhaps you'd go for something like 160 degrees. 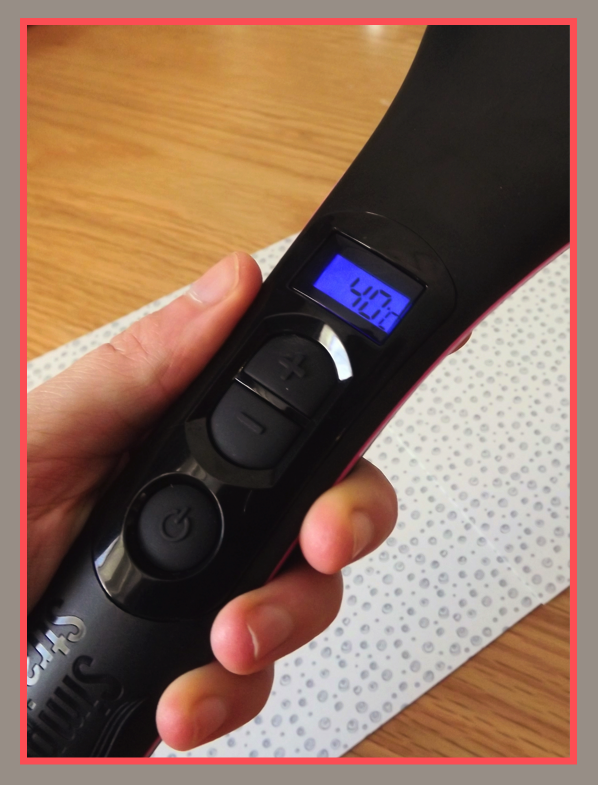 The ability to modify the temperature is also really useful in minimising damage to your hair. If you have finer hair, you might not need to use the maximum temperature to get the ultimate straightened finish - you might be able to get it from a much lower temperature. Once you've played around with the brush a few times you start to learn what your hair needs and, in the long-run, using these lower temperatures will be greatly advantageous to your hair. Moving on to my own experiences with the brush... Naturally, my hair is dead straight - so on a day-to-day basis I don't tend to use a straightener. However, I love to curl my hair, but I often find that the day after I have to wash my hair straight away as my hair is just a tangled mess. I wish I could make the curls last longer, but my fine hair knots overnight and brushing it will just make it go frizzy. This brush sounded like the perfect solution to my problem... 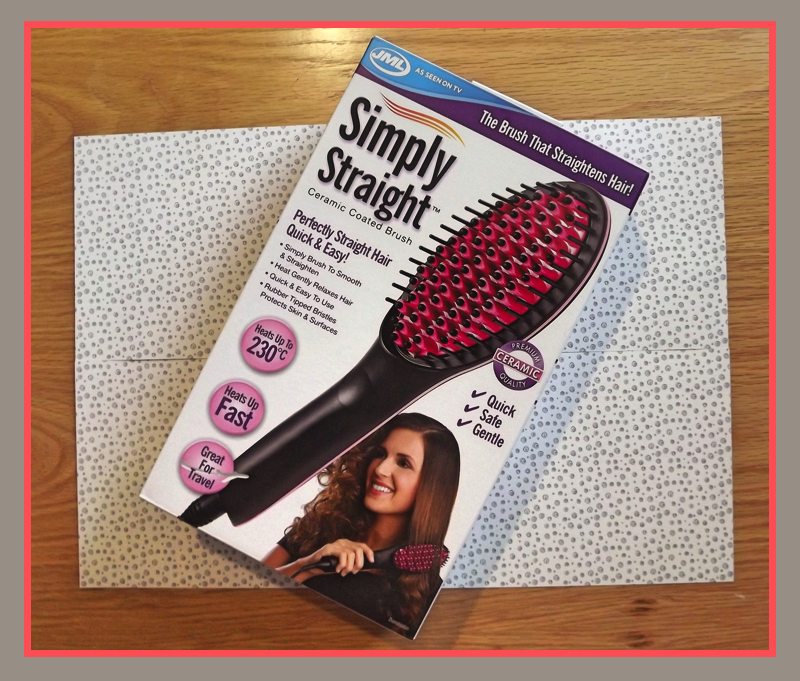 It would brush out the knots whilst straightening, thus eliminating frizz. I was also excited about the idea of being able to keep some of the curls by using a lower temperature. On trying the brush I will say that it does 100% straighten effectively. It also doesn't feel like it's burning your hair at all - when using straightening irons I can't usually touch the hair I've just straightened because it's too hot, but that is definitely not the case with this brush! Immediately after brush through your hair you can touch it with your fingers. Honestly, it just feels a little warm - but is straight. This is so reassuring as you don't feel like you've damaged your hair. The brush also works fast. 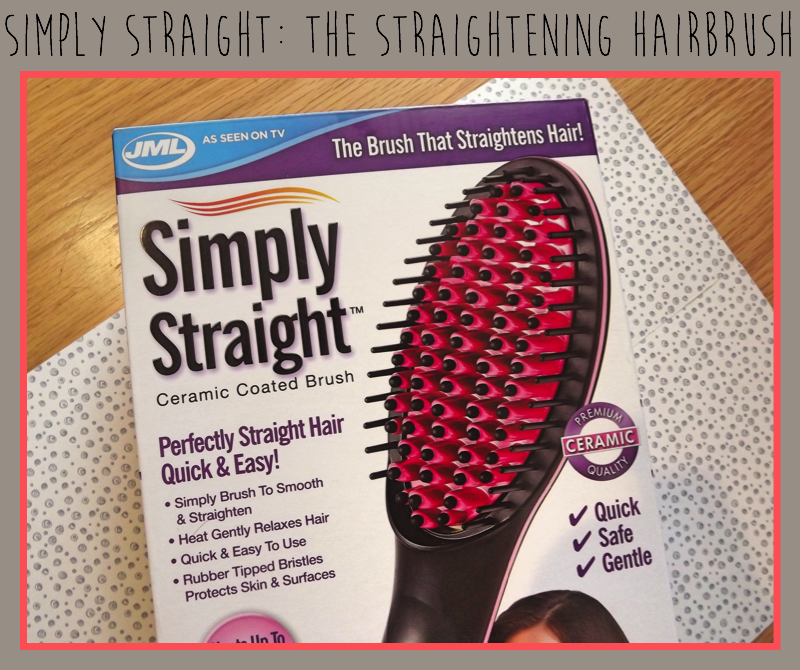 You don't have to slowly pull it through your hair - I found the straightening effect from just using it like I would my normal hairbrush. The only downside that I have found is that it's not the gentlest brush if you have fine hair, like mine. As the bristles are thick, they struggle to get in between finer strands so I did notice quite a lot of tugging at the scalp which can be quite uncomfortable. I've gotten around this by using a fine bristled brush before hand to quickly brush out the little knots. After doing this, the Simply Straight flows like a dream through my hair. I think that this brush is ideal for anyone with naturally curly or wavy hair that wants a quick and easy way to straighten. It's so much better for your hair's health to use this as opposed to a flat iron - your hair won't look or feel dry after using it and you'll be much less likely to get split ends. It's also ideal if you're like me and you love to style your hair. This brush gives you an easy way to modify your style. I've also filmed a demonstration using this brush which I'll be posting soon - so stay tuned! If you're at all interested, be sure to check out the brush's product page on the JML website: here. It's currently priced at £39.99. You can buy it direct from JML via the website or from a variety of good retailers. I've also reviewed the JML Ped Egg - a handy device to give you smooth, soft feet! Have a look at it: here.